In the Rocinha community a landslide killed a person. At the bottom of the Vidigal community, the rains caused a tree to fall, crushing a bus. RIO DE JANEIRO, BRAZIL – Torrential rains in the city of Rio de Janeiro Wednesday night left at least five people dead. The rain caused landslides, flooding and downed trees throughout Zona Sul and Barra da Tijuca. Torrential rains caused landslides and downed trees, photo by Fernando Frazão/Agencia Brasil. “The rain affected the neighborhoods of Barra da Tijuca, São Conrado and Jardim Botânico, that is, mainly the places near the mountains,” Barra da Tijuca resident, Mariangela Ribeiro told The Rio Times. “My apartment was very affected, because the pipes that drain the water from the penthouse were not big enough for the volume of rain. The water entered the residence at an amazing speed and looked like a waterfall as it descended the stairs,” she added, saying that the damage to her floorboards would only be calculated after she was able to dry up the apartment. In the Rocinha community a landslide killed a person. Near there, at the bottom of the Vidigal community, the rains caused a tree to fall, crushing a bus. According to firefighters, the bus driver was able to get out of the vehicle, but told authorities that two people remained trapped. English expatriate living in Rocinha, Jody King, a DJ and operator of a NGO English language school Favela Phoenix, surveyed the damages on Thursday afternoon. “We have a few inches of water in the school we are clearing out today,” King tells The Rio Times. “Some people have been affected much worse, though. It is (usually) a devastating sight in Rocinha when these storms come lashing in,” he added. Early Thursday Rio’s mayor, Marcelo Crivella, confirmed that firefighters had pulled out the body of a woman from the bus, and were still looking for a possible second victim. The panoramic Niemeyer Avenue, which links the neighborhoods of Leblon and São Conrado along the coast line, has been interrupted due to fallen trees and landslides. A stretch of the Tim Maya bicycle lane collapsed during the storm. Not even the Sheraton Hotel, located in front of the Vidigal community was spared. Social media videos show the hotel’s lobby flooded and armchairs floating as tourists try to get to escape the water. 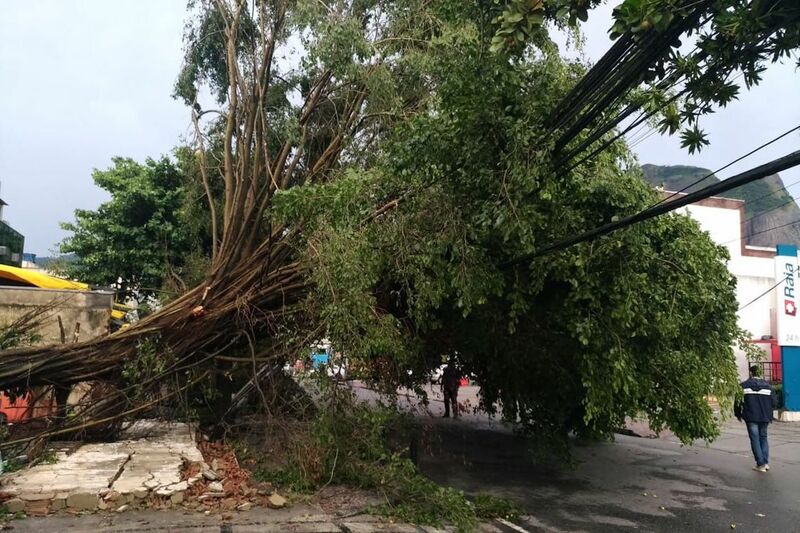 In the Copacabana neighborhood, where winds registered 110km per hour, at least five trees fell, blocking major venues and destroying several automobiles. Hundreds of residents spent all of the evening without electricity. Mayor Crivella has asked residents to try to remain indoors and only to move about town if absolutely necessary. More rain, at times heavy, is expected throughout the day on Thursday in Rio.